Concrete roofing tiles are designed for use as overlapping, water shedding roofing components that rely on the slope of a roof substrate to effectively shed water. Concrete tile roofing is a versatile, long-lasting roofing material. It is highly fire resistant and has a beautiful aesthetic appeal. Concrete tile roofing is one of the most expensive Chicagoland roof systems today. 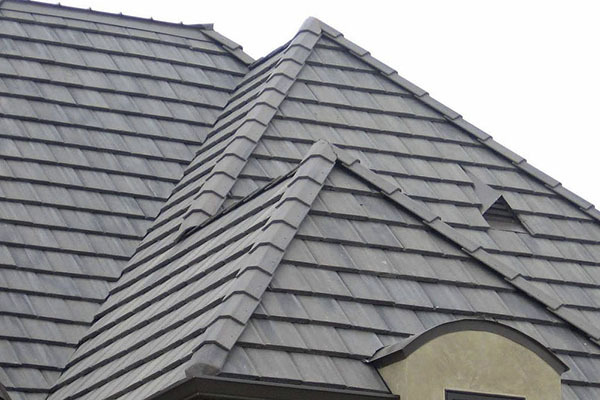 Concrete roof tile can be categorized by their shapes: flat or profile. The commons shapes of tiles are plain tile, pan or cover tile, interlocking tile, and S-tile. Concrete tiles are made of portland cement, sand and water in varying proportions. The material is mixed and extruded on molds under high pressure. The exposed surface of a tile may be finished with cementitious material colored with synthetic oxide additives. The tiles are cured to reach the required strength. Concrete Tiles generally have lugs on their undersides for anchoring to batten strips. There are additional waterlocks or interlocking ribs on the longitudinal edges that impede movement and prevent water infiltration. Concrete tiles are a heavy roofing system, which does require an appropriate underlying support structure specifications. The slope of your Chicagoland roof should be no less than 4/12 (18 degrees) up to 10:12 (40 degrees). Asphalt saturated, nonperforated organic felts are among the most common underlayments; they commonly are designated as Type 15 and Type 30 or referred to as No. 15 and No. 30, which are reflective of a once used pound per square weight designation. The terms Type I and Type II now used within the industry in lieu of No. 15 or No. 30, respectively.